This is a great garden not to be missed. Bodnant Garden is perched above the River Conwy it has views across the valley to the Snowdonia National Park. 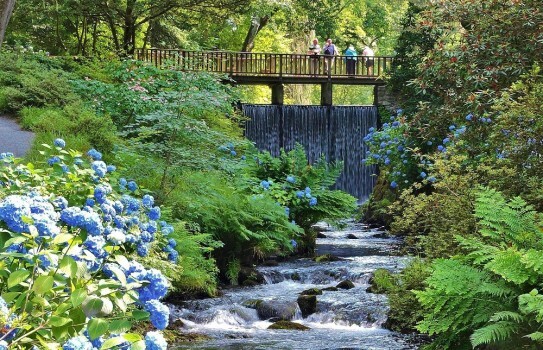 Bodnant Garden, one of the great British gardens, is a great day out for Garden lovers. Amongst the magnificent features there are no less than 5 terraces including lily pond and beautiful herbaceous borders. The gardens were started by Henry Pochin an Industrial Chemist in the late 1800's when he employed a well known designer called Milner who was an apprentice to Joseph Paxton. Over the next 50 years many plants were sourced from famous plant hunters. The garden is of interest all year round and there is a colourful winter garden. 2019 NT Bodnant Garden Information - normally open daily for much of the year. See Bodnant Garden Website for full details. Restaurant situated at entrance, tearoom in woodland area. shop, Disabled access. When is the best time to visit Bodnant Garden? Do I have to join the National Trust to visit? See National Trust Membership Link. As ever there are additions and improvements to the garden which have been undertaken by the National Trust. There are many seasonal displays including the magnificent 55 metre laburnum arch in May/June. Early interest is provided by superb collections of magnolias, rhododendrons and camellias whilst in the Autumn there are lovely colours. The garden includes National collections of Emborthriums and Eucryphia. If you want to take a break near Bodnant Garden, why not stay in one of our recommended hotels. Each hotel has genuine guest reviews enabling you to book from anywhere in the world in total confidence. Places to stay near Bodnant Garden - click here.